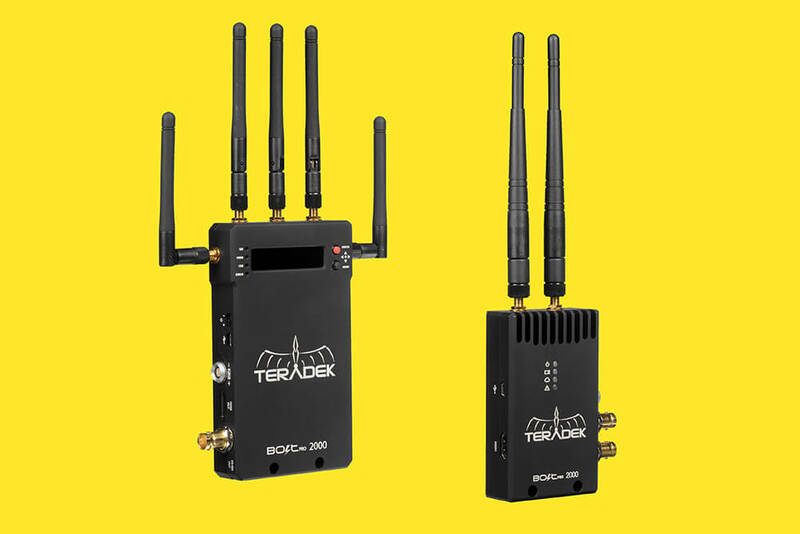 The Teradek Bolt Pro 2000 increases the range all the way up to 2000ft line of sight and includes both HDMI and 3G-SDi. Shooting a car and following from another car? Try this baby with our monitors. The Bolt Pro 2000 increases the range all the way up to 2000ft line of sight and includes both HDMI and 3G-SDi inputs so it can function on any modern camera rig. Like the 600 model, Bolt Pro 2000 can also be augmented with high gain antennas for increased range and resiliency. The Bolt Pro 2000 is a zero delay wireless video transmission system designed for the most demanding cinema, broadcast, and UAV applications. At less than 1ms latency, Bolt Pro 2000 can transmit 1080p60 4:2:2 video at up to 2000ft line of sight over the unlicensed 5GHz band. With an upcoming free firmware upgrade, all Bolt Pro 2000s will be multicast capable up to 4 receivers. Despite the number of additional receivers you add to your workflow, Bolt’s video quality and latency will remain identical to a unicast system. Have you ever wanted to use an iPad as a monitor, but still require a zero delay feed? Simply connect your Teradek Cube to Bolt Pro 2000’s loop-through or output and begin watching your live video feed on up to 3 iOS devices simultaneously at low latency. * Since Bolt Pro 2000 uses Dynamic Frequency Selection, you’ll never have to worry about interference with your Cube encoders.